About John | Paciorek's Principle of Perfect Practice - Simplicity! 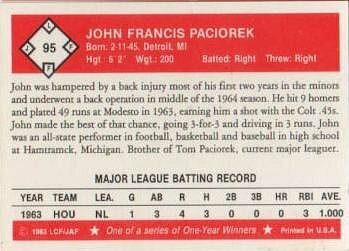 John Francis Paciorek is currently a Physical Education teacher at a small private school in San Gabriel, California. His greatest claim to fame is that he is the subject of a trivia question whose answer denotes that he is the sole possessor of the highest lifetime Batting average, Slugging percentage, and On-base percentage, in all of Major League Baseball’s illustrious history. He is famous for having arguably the greatest one-game career in baseball history. 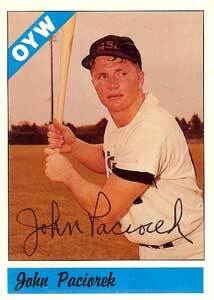 Paciorek, who had been called up when rosters expanded in September, got into the final game of the 1963 season, on September 29 as the right fielder. Besides making 3 running catches on defense, he came to the plate five times. He hit three singles and drew two walks, for a perfect career batting average and on base average of 1.000. As if that wasn’t enough, he also scored four runs and had three RBIs during the game. 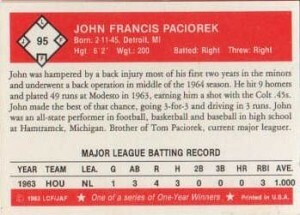 A Back injury forced Paciorek to have surgery early in 1964, causing him to miss that entire season as well as all of 1965. He tried to recover while playing in the minors until 1969 but was never quite the same player, and never again played in the big leagues. 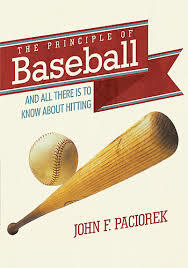 In the past 50 years since his “Big League” debut, he has devoted himself to understanding the Principle(s) through which the most efficient means to applying the proper mechanics for hitting and throwing a baseball can be taught and implemented. 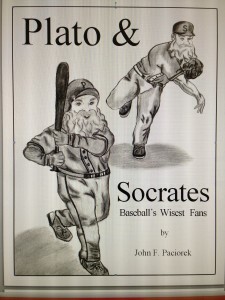 John is the author of two books, Plato & Socrates, Baseballs Wisest Fans and The Principle of Baseball, and All There is to Know About Hitting. I love your blog. You and I met in the early 70’s when you worked at the JCC in Houston. I hope you and your family are doing well. READ YOUR BLOG! ITS YOUR OLD ROOMATE NICK! FIND YOUR BLOG VERY INTERESTING BUT LENGTHY! GREAT WORK AND ILL KEEP ON READING JUST WANTED TO WISH YOU A HAPPY HOLIDAY! Talk to you soon. Keep up the great work. My 4 year old son has been amazed at the game of baseball and has recently caught intrest in the history of it. While researching we came across a picture of yours which caught his attention in which you are wearing a .22s cap. Was that a minor league team? When I first signed a Baseball contract the Colts sent me to the Arizona Instructional League. They had two teams representing them. One team was called the 45s, and the other was called the 22s. I was on the 22s. So I wore a hat with 22 on the front, as well as did every player on my team. You are just too sensible for today’s baseball. I am surprised you have not addressed the recent rise in the interest in weighted baseballs which in my opinion fit right in with long toss, towel drills and other belief based practice activities. No science supports them. I have written much on this subject. 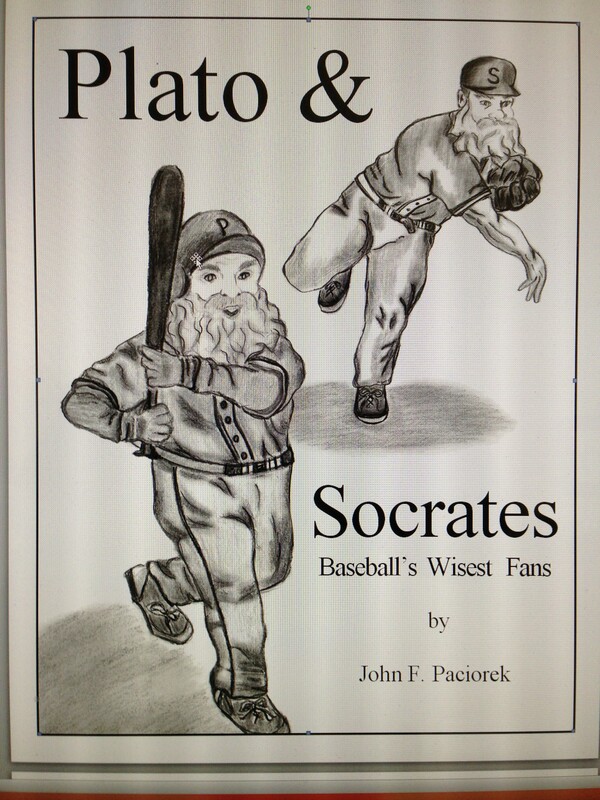 When Dr. Rushall and I co-wrote the book The Art And Science Of Baseball Pitching, we devoted 14 pages to the bad science of weighted baseballs. Now they want you to believe that as a pitcher you should use them while crow-hopping on flat ground or down the mound for acceleration and deceleration training. Parents and kids continue to look for magic bullets. Another good topic for you to tackle. Hi John…interesting stuff! My father Lawrence John Paciorek is the oldest of 10 and was brought up in Cleveland. I went to Normandy H S in Parma where I excelled in wrestling and baseball. However, our genes were not as generous in terms of height and overall size. I’m 5’7 150…now. I placed 4th in Ohio at 105 lb weight class wrestling 1987. Our baseball team fell short that year of making it to states by one game, I actually pitched a 3 hitter and we lost to Euclid 2-1.